The IDT X-Stream 1440p PCIe 2.0 offers continuous frame streaming with a PCI Express 2.0 x4 interface that achieves a sustained transfer speed of 1.75 GB/sec. This flexible design has been implemented around our CMOS sensor with Global Shutter delivering over 400 fps at full resolution (2560 x 1440 pixels). Advanced features include Frame to frame Auto-exposure, Motion Trigger and Double-exposure for PIV users. The especially tuned Motion Monitor application operates the camera in the Windows®, Linux® or Mac OS® X environments, with features that include always-on live, record while saving and on-demand playback from disk. The X-Stream 1440p PCIe 2.0 is especially suited for a variety of uses ranging from industrial and packaging inspection, microscopy, media/cine including special effects, traffic control and surveillance. The IDT X-Stream 1440p PCIe 3.0 offers continuous frame streaming with a PCI Express 3.0 x4 interface that achieves a sustained transfer speed of 3.87 GB/s; surpassing the transfer rate of its PCIe 2.0 counterpart. Its flexible design has been implemented around our CMOS sensor with Global Shutter delivering over 670 fps at full resolution (2560 x 1440 pixels). Advanced features include Frame to frame Auto-exposure, Motion Trigger and Double-exposure for PIV users. The especially tuned Motion Monitor application operates the camera in the Windows®, Linux® or Mac OS® X environments with features that include always-on live, record while saving and on-demand playback from disk. 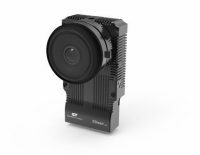 The X-Stream 1440p PCIe 3.0 camera is especially suited for a variety of uses ranging from industrial and packaging inspection, microscopy, media/cine including special effects, traffic control and surveillance. PCIe Gen.2 Cable. 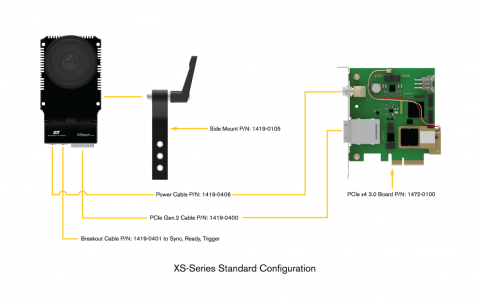 Connects between X-Stream camera and PCIe 3.0 Board 1472-0100 or Thunderbolt Adapter 1451-0100. (1419-0400-1 for 1 meter cable, 1419-0400-2 for 2 meter cable, 1419-0400-3 for 3 meter cable). (PCIe x4 Gen.2 Cable, 3 meter 1419-0400-3 comes standard with purchase of X-Stream camera). 5-pin LEMO to 4 BNC, Sync-in, Sync-out, Ready, and Trigger break-out cable. (Comes standard with purchase of X-Stream camera). PCIe x4 3.0 Board (PCIe 2.0/3.0 Compatible). For installation on computer to X-Stream Camera. (Comes Standard with purchase of X-Stream camera). Side Mount with three 1/4"-20 mounting locations. (Comes standard with purchase of X-Stream camera). Power Cable, 2-pin to 2-pin LEMO connector, 3m. 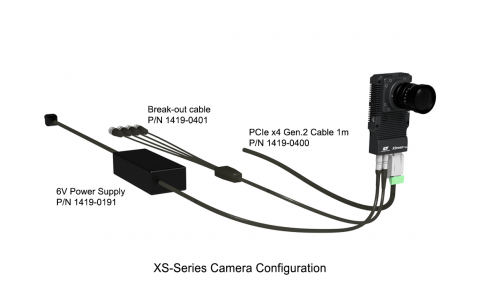 Connects X-Stream camera to PCIe x4 3.0 Board 1472-0100 or Thunderbolt Adapter 1451-0100. (Comes standard with purchase of X-Stream camera). 2-pin LEMO connector 6V Power Supply. Connects directly to 1x X-Stream. For use when no power port is available from the PCIe x4 3.0 Board (1472-0100) or Thunderbolt Adapter (1451-0100). (Comes standard with purchase of X-Stream camera). Thunderbolt Adapter. Communication interface between X-Stream camera and computer. (PCIe 2.0/3.0 compatible). (Requires Power Supply 1451-0108-1 or Power Supply 1451-0108-2 for power source). Thunderbolt Adapter 12V Power Supply (EU Standard). 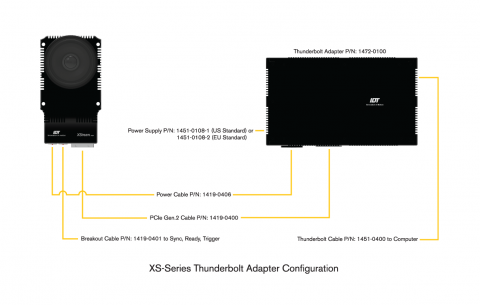 Provides power to X-Stream Thunderbolt Adapter 1451-0100. (Note: Either 1451-0108-1 or 1451-0108-2 is required to power Thunderbolt Adapter 1451-0100). Thunderbolt 3.0 Cable, 1m. Connects between Thunderbolt Adapter 1451-0100 and Computer. F-mount adapter, provides F-Mount Lens Compatibility for cameras with C/F-Mount. PCIe Active Optical Cable, 10m. Connects between X-Stream camera and PCIe 3.0 Board 1472-0100 or Thunderbolt Adapter 1451-0100.